Professor Lakshman Dissanayake entered the University of Colombo in June 1973 as an undergraduate and continued his association with the University by joining the University as an academic after obtaining First Class Honours for his first degree. Professor Dissanayake received his postgraduate qualifications: PG Diploma from the University of Colombo; Master of Arts from the Vrije Universitiet Brussels, Belgium and PhD from the University of Adelaide Australia. He is a Fellow of the Royal Society of Arts (FRSA) in the United Kingdom. He serves the University of Colombo as a Senior Professor in the Department of Demography at present. During Professor Dissanayake’s tenure in the University of Colombo, he was appointed to various Academic as well as Administrative positions. He has served as the academic sub-warden, academic warden, student counsellor, Coordinator of the Demographic Training and Research Unit, Rector of Sri Palee Campus, Dean of the Faculty of Graduate Studies. 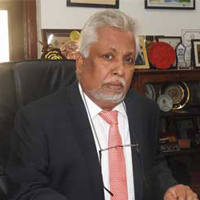 Professor Dissanayake has officiated as the Acting Vice Chancellor of the University of Colombo on many occasions. Professor Dissanayake founded the Colombo University Community Centre (CUCEC) which is the first multidisciplinary centre in the whole University system devoted to community extension related work. Professor Dissanayake functioned as its founding Director. Professor Dissanayake has been honoured with various esteemed positions and has received awards both nationally and internationally for his contributions to the field of Demography which are highlighted here. Recipient of the prestigious Population Council Fellowship (USA) for his PhD research at the University of Adelaide. The ‘Excellence in Research’ award, University of Colombo. CVCD Award granted for the ‘Excellence in Research: – Highest Grant Recipient’. Visiting Professor, at the Faculty of Health and Social Sciences of the Leeds Beckett University, United Kingdom. Adjunct Member of the Australian Population and Migration Research Center in the University of Adelaide, Australia. Invited by the SAARC Secretariat as an Independent Expert to prepare the SAARC Regional Poverty Profile 2009-10. A member of the Research Panel to review the research proposals for research awards offered by the SAARC Cultural Centre. Lead Consultant for the preparation of Population Situation Analysis of Sri Lanka for the United Nations Population Fund. Prepared four policy briefs on population dynamics for the Asia Forum of Parliamentarians on Population and Development. Honoured by the Department of Immigration and Citizenship of the Australian Government by inviting him to serve as a member of the Research Advisory Group. Professor Lakshman Dissanayake’s expertise includes regional demography, regional development planning, health demography and post-disaster reconstruction. He has published books, book chapters and numerous research articles in local and internationally reputed journals. Professor Dissanayake has spent more than 40 years of his life in the ‘University of Colombo’ and his commitment and dedication to the teaching, research and National development has enabled him to contribute to the development of the ‘University of Colombo’ as well as the nation at large.